Notes: Unless otherwise stated, this pattern is worked in continuous rounds using stitch markers to locate the beginning/end of a round. Work in somewhat tight stitches. Yarn colours indicated in pattern are for reference. Using 4.00mm hook. 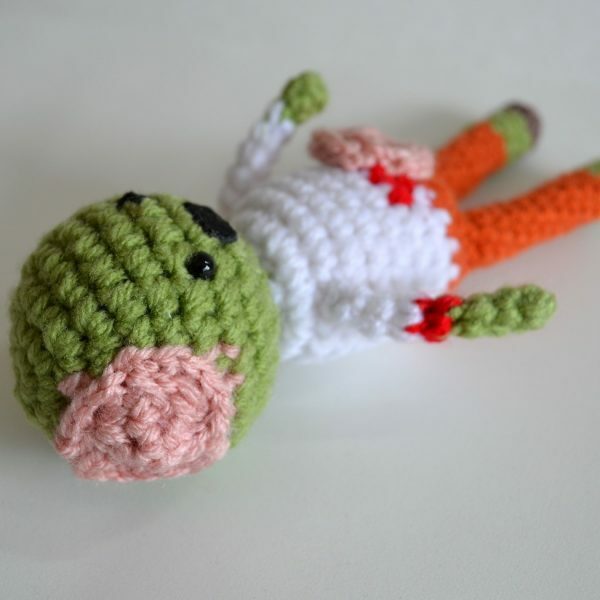 To make brain detail alternate with green and pink yarn in rounds 2 – 4, size of exposed brain is up to you. Attach/sew eyes and mouth and begin to stuff. Using 4.00mm hook and starting with white yarn. Use red yarn to add blood detail for spilled guts. Continue to dec until closed. Fasten off and weave ends. Using 3.00mm hook and starting with green yarn. Round 1: start 4 sc in magic ring. Switch to white (shirt) yarn. Fasten off and leave tail for sewing. Optional: Use red yarn to add blood detail. Using 3.50mm hook and starting with green or brown (shoe) yarn. 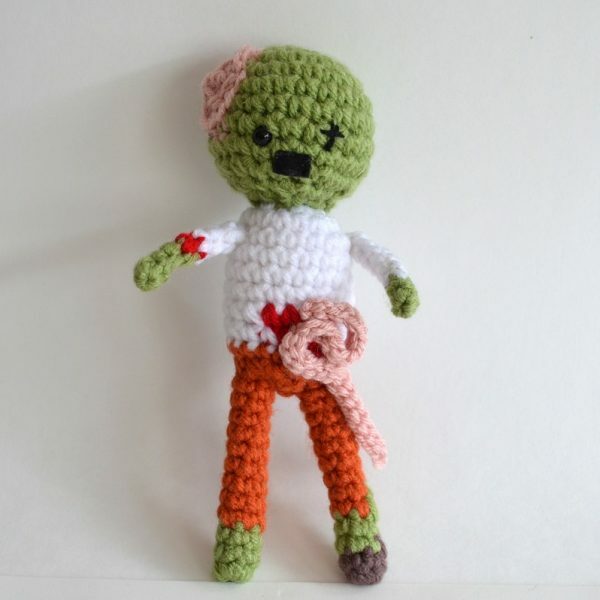 Alternate between green and orange yarn (skin and pants) depending how ragged you want the zombie to look. Using 3.50mm hook and pink yarn. Ch 30, sl st in 2nd ch from hook and each ch across. Fasten off and sew to body, twisting and stitching to make it look like intestines spilling out. Use a small hook to do superficial sl st and sc in brain area to create bumps and texture. Thank you! 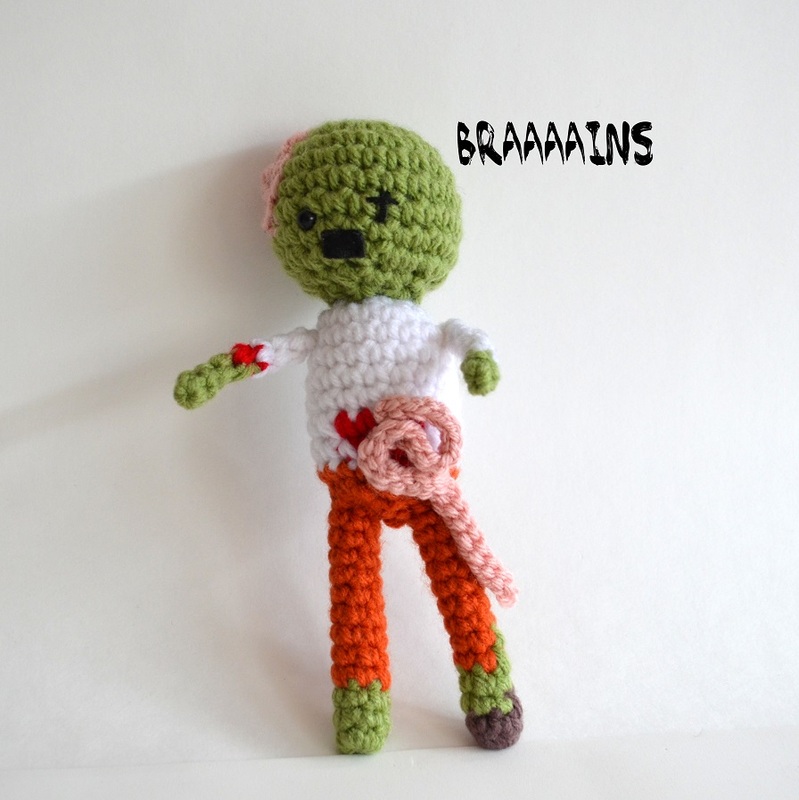 Checked out your zombie, it’s awesome!